Following our previous tête-à-tête on the Heartland Affair, here's a response to Bob Murphy's latest post on climate change. ACT 1: A group of 16 self-proclaimed climate skeptics write an op-ed in the Wall Street Journal, "No need to panic about global warming". ACT 2: William Nordhaus, professor at Yale University and one of the founding fathers of climate change economics, pens a widely cited essay in response, “Why the Global Warming Skeptics Are Wrong.” Among other things, Nordhaus takes umbrage with the fact that these skeptics have bungled his own research in trying to argue that climate change is not cause for concern. ACT 3: Enter Bob Murphy, who comes to defend the honour of the original skeptics in his article, "What Nordhaus Gets Wrong". FINAL ACT: Stickman Grant McDermott sweeps in from the shadows to set right the wrongs of the blogging world. Order is restored, women swoon and the sound of childrens' laughter fills the air. Murphy curses and retreats to his secret lair, vowing revenge. Bob claims that Nordhaus is using a rhetorical slight of hand in addressing the skeptic claim that global temperatures have not increased in 10 years. Nordhaus does this by referring to the instrumental temperature record, which dates back to the 19th century and shows a clear warming trend. Bob claims that this isn't fair, since "no warming in the last decade" and "no warming since 1880" are different statements. To be frank, this is simply dancing around the issue. If the original claim was meant to serve no purpose beyond itself, then perhaps that would be okay. (Vacuous, but okay.) However, the implication and inference of the skeptics' original statement was abundantly clear: Global warming has stopped, so all this talk about dangerous increases in future temperatures is probably bunk. [*] Nordhaus rightly points out that this is a meaningless observation and that only long-term trends can provide proper context. However, Bob tries to head off this approach too, by providing a long-term graph with rescaled Y-axis; ostensibly to show that temperatures have hardly changed in absolute terms over the last 150 years. Bob largely bases his comments here on a Master Resource blog post, which in turn cites a paper by Santer et al. (2011). Now, the main purpose of this study is quite technical in that it aims to show how different timescales can affect the ability to distinguish between climate "noise" and "signal". (Ironically, their bottom line is that we gain no understanding of climate change drivers simply by looking at the temperature record from a single decade.) However, we don't really need to concern ourselves with that here. The relevant issue \(-\) and the one that Bob limits his discussion to \(-\) relates to the below graph. 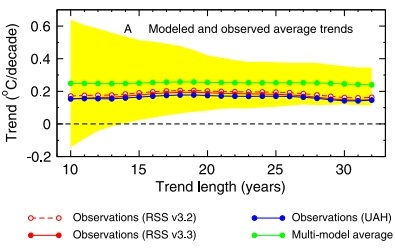 It shows temperature measurements of the lower troposphere (TLT), as "observed" by two satellites (RSS and UAH) and predicted by climate models. Without going into specific details, Bob uses this as evidence to suggest that climate models exaggerate the warming effect in comparison to what reality will turn up. Translation: The models have performed exactly within the bounds of what we would hope for. I find it... interesting that Chip Knappenberger (author of the MR post) chooses to ignore these caveats and findings, instead offering his readership an alternative conclusion that the models are on the "verge of failing". But then what do Santer & co. know? I mean, they just authored the study. As for the assertion that Nordhaus is arguing against a strawman by focusing on the role that human activity has played in driving climate change, versus the alternative (weaker?) claim that the models have simply overestimated warming full stop... Let's consider the original WSJ op-ed again: "The lack of warming for more than a decade[...] suggests that computer models have greatly exaggerated how much warming additional CO2 can cause." (Emphasis added.) You could perhaps argue that the statement is ambiguous, but I certainly don't think that Nordhaus is unjustified in highlighting the fact that, only by including CO2 alongside natural forcings, can we square model predictions with observed warming. For more on the track record of computer models in predicting actual climate outcomes (including reconstructions of the past), see here. Look at the graph and tell me where your "ideal" temperature increase lies. The answer should be obvious: Around 1°C, since this is where we maximise welfare. Anything beyond that and you are doing worse than you would at the 1°C optimum. Another reason to be very cautious about the benefits of unimpeded CO2 emissions include disproportionately large downside risks (i.e. "fat tails") and, indeed, even regular loss aversion. If someone offers you the chance to flip a coin so that you either win $10,000 with 50% probability, or lose $9,500 with 50% probability, would you take it? I suspect that a clear majority of people would decline to take part in such a game of chance, even though the expected value is positive (i.e. $250). The idea that people value losses more than gains is very well established in the theoretical and empirical literature. Lastly, we would also need to consider the regional disparities in any presumed gains. Africa, for instance stands to be the big loser from climate change, while Eastern Europe wins due to increased agricultural output. Needless to say, this throws up some very thorny ethical issues around the potential benefits that some countries might enjoy at the expense of others. Okay, Bob is quick to say that the WSJ skeptics "screwed up" here. 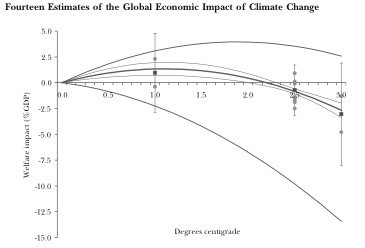 Anyone that has read Nordhaus's work knows that he as long called for Governments to put a price on carbon. Still, Bob now offers up one of this own papers to show that... well, it would seem that changing various factors in a climate model can lead to substantially different results. To be honest, I'm not entirely sure what to do with this. Admittedly, I haven't read Bob's paper \(-\) I'll hopefully do so when I get time \(-\) but in his blog post at least he is making some pretty unremarkable points. For instance, Al Gore apparently has some very bad policy recommendations. Okay, but Nordhaus never mentions Gore in his essay and neither do the 16 WSJ skeptics. (Personally, I'm not particularly interested in what AG has to say about the economics of climate change and I certainly can't think of any major nation pushing for 90 percent emission reductions by 2050.) As for the fact that Nordhaus "assumes" that his calibrated carbon tax will be perfectly implemented over time... Um, yes, that's how benchmarks work. We describe the first-best scenario and then look at how deviations from that optimum will impact results. Nevertheless, let me try to reply in kind by saying that I, too, have nagging problems with Nordhaus' methodology. In particular, using observed market rates for making normative judgments and implicitly assuming perfect substitutability between man-made and natural goods. I have previously written about these issues here and here. THOUGHT FOR THE DAY: The Wall Street Journal continues to push climate change opinion that is highly misleading and, at times, patently wrong. Bill Nordhaus did us all a service in picking apart some of the more egregious mistakes, as exemplified by this particular op-ed. Bob Murphy makes some interesting points in response, but I don't see that he offers any substantial rebuttals of the fundamental criticisms levied at the "WSJ 16". Nordhaus continues to have the right of this, as far as I am concerned. Obfuscation, begone! It's easy to misinterpret Figure 1 from Tol (2009). Initial warming is indeed likely to be beneficial: CO2 fertilization of crops, reduced spending on heating homes, and fewer cold-related deaths are the main factors. However, totals do not matter. The incremental impact turns negative around 1.2K. If we were able to control climate, we would warm the planet by 1.2K and stop there. However, the momentum of the climate system and the energy system is such that, if you accept the mainstream view of the workings of the climate, we cannot avoid 1.2K warming, or 2.0K warming for that matter. The initial benefit is thus a sunk benefit: We will enjoy it regardless of what we do. [*] The original WSJ op-ed also makes use of the much misrepresented quote by Kevin Trenberth from the "Climategate" emails. That is: "The fact is that we can't account for the lack of warming at the moment and it is a travesty that we can't." For more on that issue, see here. [**] Part of this probably has to do with the fact that they employ a convoluted modeling procedure to produce temperature readings. For starters, satellites do not measure temperature directly, but rather various signal wavelengths that must then be mathematically inverted to obtain indirect inferences of temperature. I should also say that the UAH temperature set referenced by the Santer et al. study, which is produced by John Christy and Roy Spencer, is particularly contentious. You can read more about these issues here and here. Nope, Nordhaus is still (mostly) right was published on May 13, 2012 .